I first visited Auckland nearly 30 years ago. It was a different city, I was a different person. A fresh-faced 20-year old on the road (in a plane) with the band I had played bass with since I was 16. I wasn’t a great bass player, we weren’t a great band, but we had something; energy, attitude, good tunes and a freshly-pressed EP to promote and sell. Like a lot of people who had grown up in Christchurch, I was pretty dubious about Auckland, the brash, domineering big brother in the national media and consciousness. The largest city in the North Island, it was a natural rival for the biggest city in the South Island. But that wasn’t on my mind so much when I flew in with my four bandmates, it was the gigs and interviews we had lined-up. The boxes of records we hoped to sell, and the crucial uncertainty of whether or not Radio With Pictures would play our video before we left town. 30 years in a long time in the life of any city. It’s the life of a human generation (although desperate marketeers and journalists have been shortening that natural span in the last few decades). Pressed-vinyl EPs are no longer the best way to get music to punters and music videos are available at the swipe of a device (as opposed to being confined to a single showing in a dedicated TV show once or twice a week. Miss the show or fail to programme your VCR correctly and you would have to imagine it from the descriptions of your friends). Then it was off to walk into the record shops dotted along Queen Street, trying to sell our wares at $6.99, sale or return. I think we got rid of a pitiful 1 or 2 in a couple of shops. Queen Street was long, wide and steep to me. Chch is a flat city. I headed off up to explore the famous/infamous K’ Road at the top of Queen Street by myself, fuelled by one or two beers (and the Valium one of the singers had scored from a friendly doctor to calm our nerves). Why am I reminiscing about my first visit to Auckland? Because I am flying there now. At the moment we are passing over Kapiti Island, having taken off from Wellington into 120km winds. 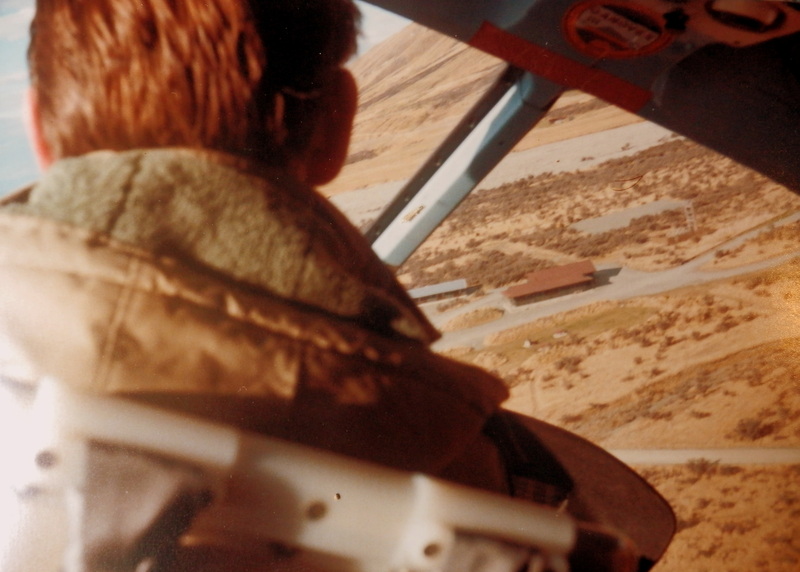 The take-off was as bumpy as it was sitting on the tarmac, buffeted and battered , waiting to taxi. But I’m a pretty solid traveller, I never feel queasy. Plus I was distracted by being allowed to write this while we were taking off…a first for me as I have been used to the ‘switch off all electronic devices’ rule that has only just been relaxed. It’s 3 years since I was last in Auckland. That time I spent little time in the city, heading straight to the ferry and 2 nights on Waiheke, my island home in the Hauraki Gulf I left 8 years ago. I spent that visit swimming at Palm Beach, my favourite bit of paradise. I had hoped to squeak in a visit this time, but I am only in Auckland for a little over 48 hours so it looks a bit tight. Plus I have been alerted by a friend to the fact that Waiheke is experiencing an outbreak of sea lice due to the exceptional, record-breaking summer. I ache to re-visit paradise and swim in the eternity of summers past. But sea lice?! Hmm. The volcanic rump of Mt. Ruapehu has disappeared from my window and the plane has started to descend. I’m being offered sweets (hooray for the traditions of Air New Zealand which also gave me a snack and a drink without asking for payment). What will these (nearly) 3 days in Auckland hold? Memories and observations by the bucket load, I imagine. I lived there for 13 years. Flew into the watery isthmus countless times. As I am travelling alone my only plan is to write and reflect. Walk the old paths. Seek the old favourite eats. I may try and meet friends, I may not. I would be nice but time is short. We are all older with commitments of time and responsibility of all sorts. The excuse for this trip (taken on a whim and Airpoints) is an old TV colleague’s 50th. I’ve never been to a 50th. It makes me feel old. A bit excited. Curious. Nervous. I hope I don’t bottle out. I’m terrible for that sort of thing. There will be people there from all those years I worked in telly, including a few who I trained with at the NZ Broadcasting School in Chch 22 years ago. A small reunion of sorts. How did we get this old? What is everyone doing now? Why did we create a dormant group on Facebook? Questions never end. Nor should they. How have 30 years passed since I first flew into Auckland? We are landing. Auckland is here. This entry was posted in Blogs, Memoir, Music, Travel, TV and tagged All Fall Down, Auckland, long weekend, Radio With Pictures, solo travel on March 11, 2016 by Kambl. It Was 30 Years Ago Today… A Month In The Life, oh Boy! I always say I was born in the Summer of Love; a deliberately wry comment as I was born in the middle of a Christchurch Autumn at the bottom of the South Pacific far from Haight Ashbury, of parents not just of a generation before the hippies, but even before Elvis et al influenced the infant Beatles. That said, as Sgt. Pepper’s Lonely Hearts Club Band was released a month after my birth giving me a(n admittedly) wishful spiritual connection to that album I’ve decided to look back at my life 30 years ago today. Yes, I know Paul sings …it was 20 years ago today… but I’m choosing 30 years as that was when I started a (nearly) daily writing habit. 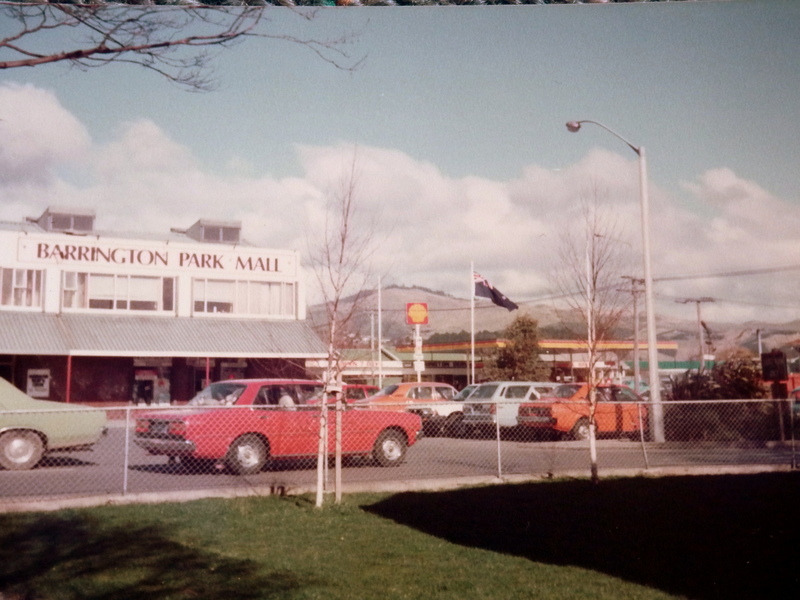 In August 1984 I was a 17, in my last months of school, living in south Christchurch at the bottom of the Port Hills with my parents, 2 younger sisters, dog and a pet mouse called Alf (named after Alison Moyet, who was still in Yazoo). As that last comment would indicate, music was a big part of my life: Rip It Up, NME, The Face were all regularly consumed and I spent a fair amount of time trawling through record bins and buying records (Planet Records, Radar Records, Record Factory). I had a part-time job at a bakery in Sydenham, Coupland’s Hot Bread Shop* (CHBS, not to be confused with my school, CBHS) where I worked in the early hours of Saturday morning earning $14 an hour (you got double time working weekends back then) to spend on ($10?) records or musical equipment (at the start of the year the school boy garage band I had joined/formed the year before had gone ‘professional’ playing in pubs). Okay, to say we were professional is a stretch, we were endearingly enthusiastic amateurs, but we were getting paid as much as we were not…often the standard $50 fee given to support acts at the Star & Garter or Gladstone. Quite a cool feeling for a cocky/unconfident schoolboy aged 16 at his first gig. I never drank alcohol, hated the taste, plus I was also terrified of the intimidating police who marched into the pubs looking for people like me. All this I can write off the top of my head without looking back into what I wrote at the time. 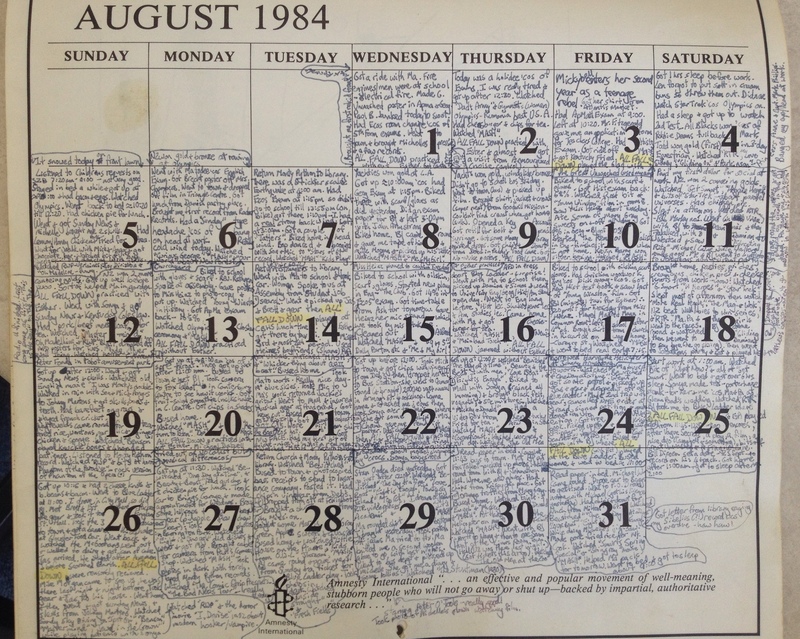 I could write a heck of a lot more, after all I decided I was writer as a child in the 70s, but I want to keep this focussed: it’s about August 1984, for no other reason than it is August 2014. Vogarts: ball-point tubes of fabric ink, $7 each. Tricky to draw with as material stretched (and no such thing as white-out). 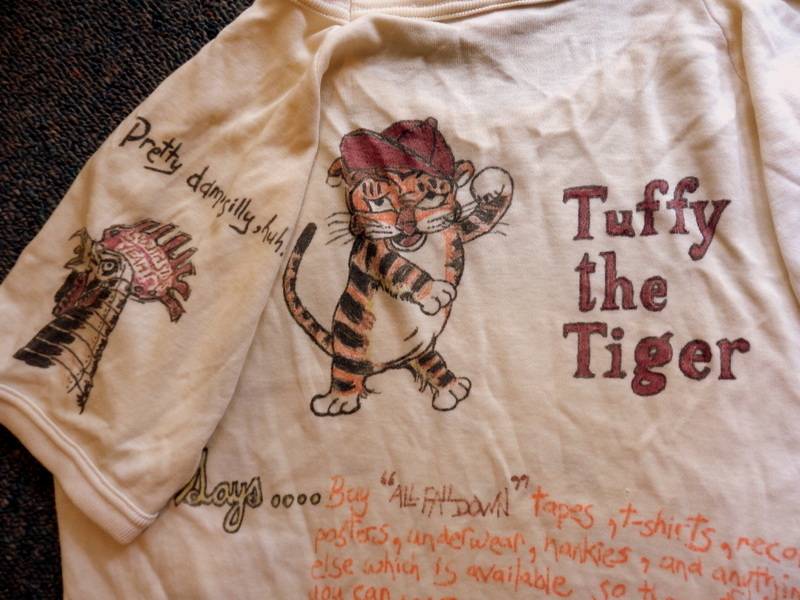 Detail of band t-shirt. Like all writing, once you start, it’s hard to stop and the days quickly filled with as much as I could fit in. By August each wee square is chokka block with detail. Which isn’t to say that it is interesting detail; no secret crushes, pashes, binge-drinking or school boy hi-jinks, but what I’ve come to believe as a historian is that it is often the mundane that is most ignored and absent. I always wonder, but what did people do with all their time? And if we know, how did they do it? What’s missing? It tends to be the BIG things that get written down. Which isn’t to say nothing happened in August ’84; the month starts with the L.A. Olympics and there seems to be day after day of NZ winning gold or silver in something or other (it was our greatest haul, shitting-off the Aussies no-end, who got nowt causing them to pour hundreds of millions of dollars into sport to fix that politically/socially important situation). The All Blacks whopped the poor old Wallabies, too, thanks to Robbie Deans being at full back, I note (I recall a rivalry with the walrus-moustached, pantyhose-wearing Wellington full back Allan Hewson). On the 28th Stan Ogden died (never a big Corrie fan, this was none-the-less worthy of note). On the 21st I ate my first piece of quiche (prompted by the popular book of the time about what real men did/didn’t do). And, rather quietly, with nothing else said, on Tues 7th there was a 5.0 earthquake at 4am. On the mundane level, I appeared to watch a lot of television (an indicator of my life working in TV, maybe? ): MASH, I Dream of Jeannie, Hogan’s Heroes, Bewitched, Love Boat, Eight Is Enough, One Day At A Time, Fresh Fields, Little House On The Prairie, The Old Men At The Zoo, What Now?, Flipper, Capt. Scarlett, Return To Eden, Gliding On, The Smurfs, Me & My Girl, The Mainland Touch, Beauty and The Beast, It’s Academic, Shazam, Kids from O.W.L, Benson, Bad News Tour, Ready to Roll and Radio with Pictures all get a mention. The last two were the most important by far, being the only place to see music videos in a pre-MTV, YouTube world. RTR was a countdown of the Top 20 which played at 6 pm on a Saturday night so was essential viewing before going out. RWP was more cutting edge; at 9:30 pm on Sunday night, giving a coda to the weekend, a peek at what is to come, something to be discussed on Monday morning. I watched it every Sunday. On the 5th they played The Verlaines and Joy Division (that morning: snow on the front lawn, listened to Children’s Requests on 3ZB 07:20 to 08:00 – not very good). Of course, I aspired to be on RWP (and managed it 3 years later) which is why, in my memory, All Fall Down, practised incessantly (no girlfriend, eh?) throughout those years. 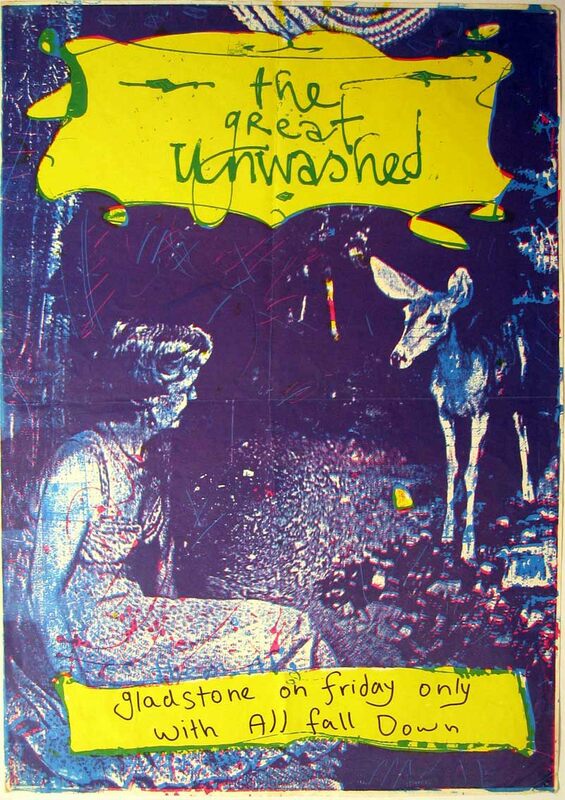 Pretty poster, possibly by Hamish Kilgour? But if I look at that August, there were only 7 practices, and, goodness, 5 gigs!!?! That’s a pretty good ratio, I doubt if it got any better. 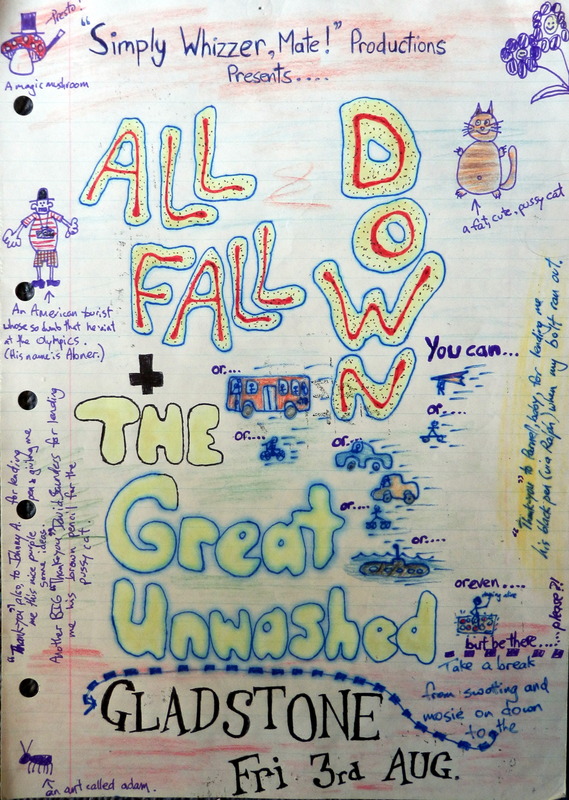 The first was on the 3rd at the Gladstone with The Great Unwashed. I was pretty over-awed, The Clean (their precursor) were heroes/gods of the Flying Nun scene who I had watched on RWP and Dropa Kulcha (and maybe Shazam) and when David Kilgour jumped off stage at the sound check to shake my hand, saying ‘Hi, I’m David’, I had to stop myself from saying ‘I n-n-know’. I remember none of the gig but we must have done okay as we were asked to support them in Wellington at the end of the year (on the road…with The Great Unwashed?! sort of…wow). 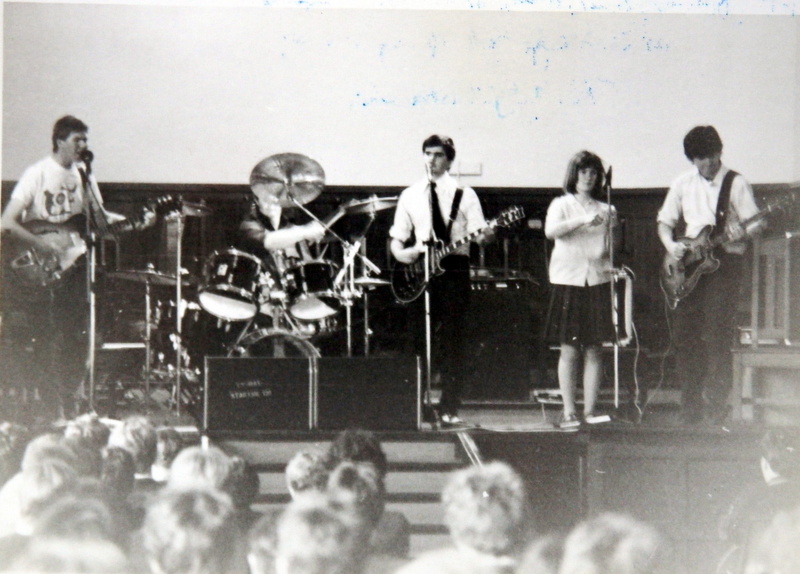 Next was a lunchtime gig in my school hall at CBHS on the 14th where we had assemblies or were entertained by Hey, Wow! type Christian groups or blind organist Richard Hore and has Farfisa (why did he have to wear slippers?) It was quite a thing to organise as Blair was now working, Jason went to Cashmere, Esther to Linwood and there was some sort of rivalry between the principals to be negotiated in these pre-Rock Quest days when any music other than orchestra or jazz was seen as a rather sketchy activity, educationally. To top it off, drummer Brett was required to go AWOL from the army (we were a ‘dangerous’ band..ho ho). All I remember is that it was wonderfully loud and I took off my school tie to play (I went to a rather formal school). What I’ve noticed from my calendar is lots of mentions of Miss Heinz…Miss Heinz called re. gig…gave posters to Miss Heinz…borrowed PA from Miss Heinz’s boyfriend…returned mic stand we mistakenly took to Miss Heinz…got $31 from Miss Heinz from door (minus $11 Esther’s taxi = $20 profit). I cannot remember what she looked like or what she taught, but I was clearly in want of a girlfriend. The next two gigs were at the Bill Direen’s Blue Ladder in Cashel Mall on the 23rd & 24th. There’s a lot I want to write about this place so I will keep this short (I wanted this blog to be 700 words, tops, and am already at 1,443…sigh). 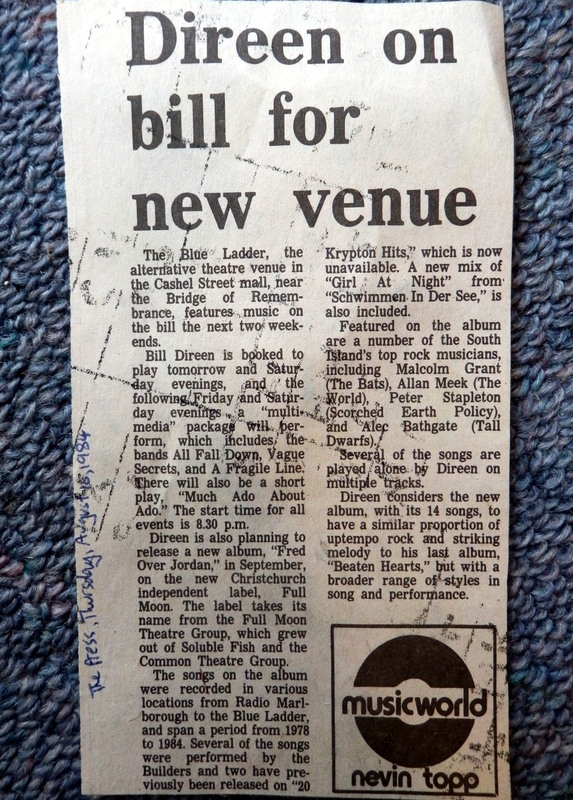 The Blue ladder was an informal ‘warehouse’ venue with plays, alt music performance and recording. On the 2nd night we ‘head-lined’ playing at midnight after Vague Secrets, A Fragile Line, a play, a film, and a duo. Bad puns do not suit a man of arts and letters like Bill Direen. But, hell, we got in the Press! Then on the Sunday afternoon (3 gigs in a row, wow!) 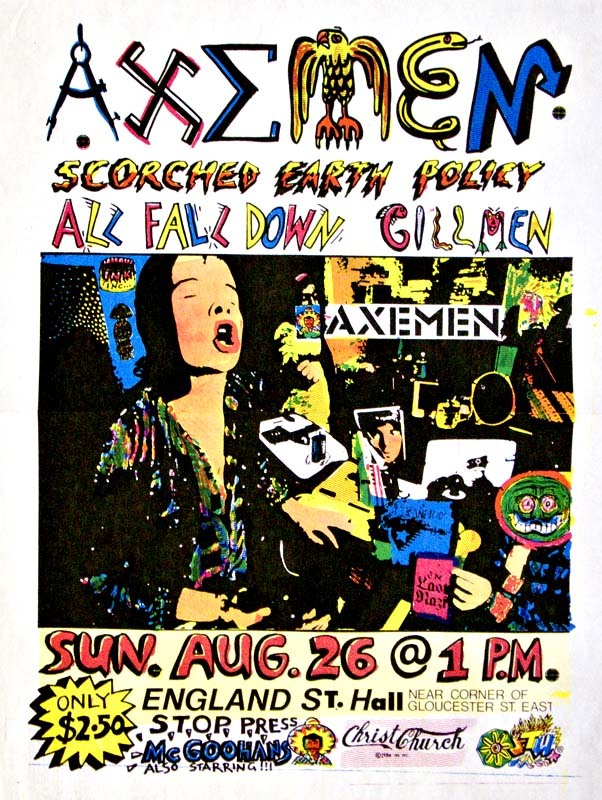 we played a Christchurch crusty hall gig (lots of such informal gigs in those days) at England Street Hall with lots of scary/friendly alt. types smoking and drinking. I remember cowering around the edges, not drinking alcohol. I went to the dairy and got a can of coke after the McGoohans played (apparently). But apart from all the music guff (20th tried out Michael Dalzell on vox… rejected because of ‘musical differences’…no memory of that!… 12th student radio station, Radio U, finished transmission with The The’s ‘This Is The Day’, the same song they started with) what sticks out from all my tiny, scrawled words is all the food. In fact, I felt a bit sick reading it. Every Sunday I walked the dog, Angus, to Johnny Marten’s Food Mart (a charmer of the ladies, lots of young lads helping out…a police raid) with my sister Michelle to get the Sunday News and ‘skulls’ (white choc, er, skulls with red liquid inside; bite them right and blood squishes out their eyes). Many mentions of Mary Gray green apple lollies, Krispy Chips, chips & vinegar from Deb’s, Paddy’s Food Lane, banana milkshakes from Gloucester Food Bar, Beaver Bars (pineapple?! 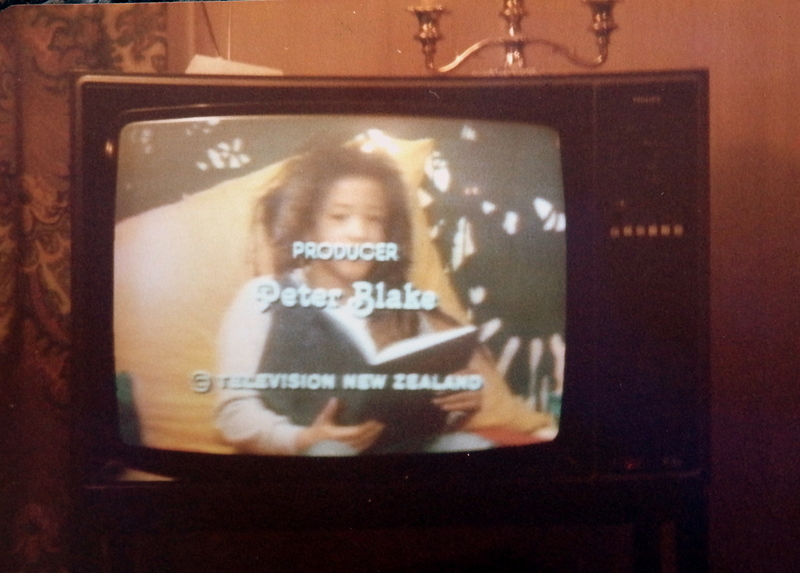 ), KFC Video Box (no McD’s or BK in ’84 Chch), and Big Garry’s cheeseburgers from Selwyn Street on a Thursday night (best ever…the way he crisped the melted cheese..mmm, can still taste it). But it wasn’t just the junk that got noted. On the 25th sister Sonya made her and me porterhouse steak as Mum and Dad had gone to Glen Poad’s wedding. 29 Aug we played French cricket on the front lawn when our good friends the Wagtevelds came to dinner where we had fried rice, wontons, garlic ginger chicken and sponge cake (all home-made). The meal was followed by ‘Benson’ then us kids (me, my sisters and Michael) played knucklebones and 4-handed patience (a family fav.) listening to Monty Python records from the library (the adults would have sat at the table with a little alcohol, many cigarettes and much talking). On the 31st Michael came round having got his driving licence the day before (funny he waited till he was 17 while his father taught me how to drive when I was 15) and we had chips and donuts from Milton Street. Later I made pork fried rice for Mt.Cook and helped Mum pack for the trip (it was the school holidays and we were about to head off on one of our excellent occasional holidays amongst the Southern Alps at Mt. Cook, this one where ‘Uncle’ John shouted us kids a flight up in a helicopter into the mountains which made him rather green). Over all, a funny month; I appeared to sleep into near noon each day as we had time off to do test exams for the end of year exams…something I couldn’t get my head around so it was quite a waste of time. Of course, all the late night gigs plus working in the bakery in the wee smalls didn’t help (and I was 17). On the colder days when I biked to school for said test exams (a distance of about 6 kms) I wore gloves, scarf and oilskin. You don’t see many oilskins these days: must be something to do with peak oil. 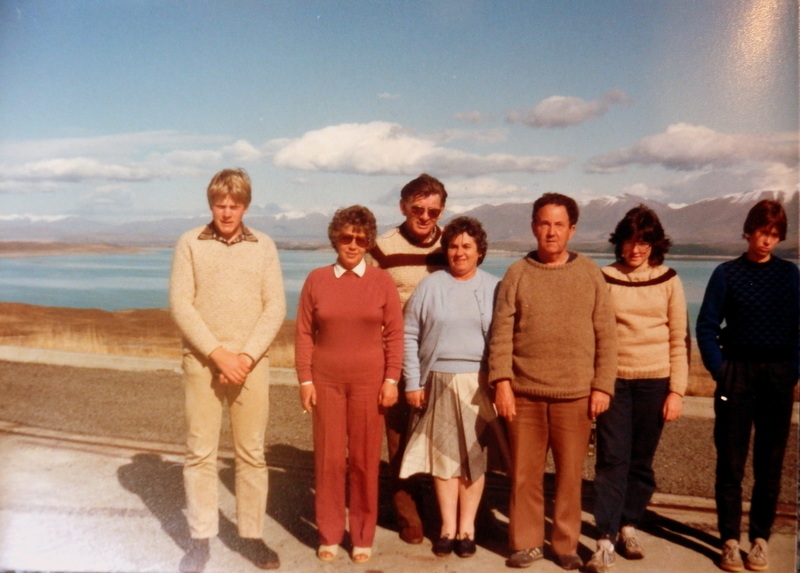 Then, later in the month it was the school holidays, hence the trip to Mt Cook. Lake Pukaki, heading to Mt Cook. Clearly, I’m struggling with the weird viewfinder. Knitted jerseys de rigueur for the mountains. 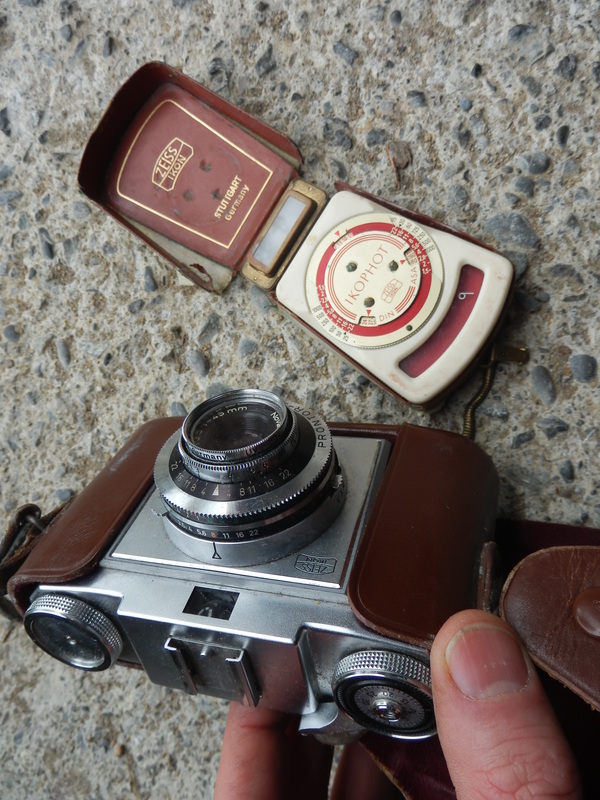 On the 11th, one of my other great passions was fed when Dad passed on to me the Zeiss Ikon camera he had used since the early 1950s. A good camera, but a bit of a beast, it was fully manual with a peep-hole viewfinder which explained why he often took badly-framed photos. It also had an external light meter which I thought was pretty cool. I note that he showed me how to use it, but that on the 20th I went to Fox Talbot in town to get some pointers from a professional. 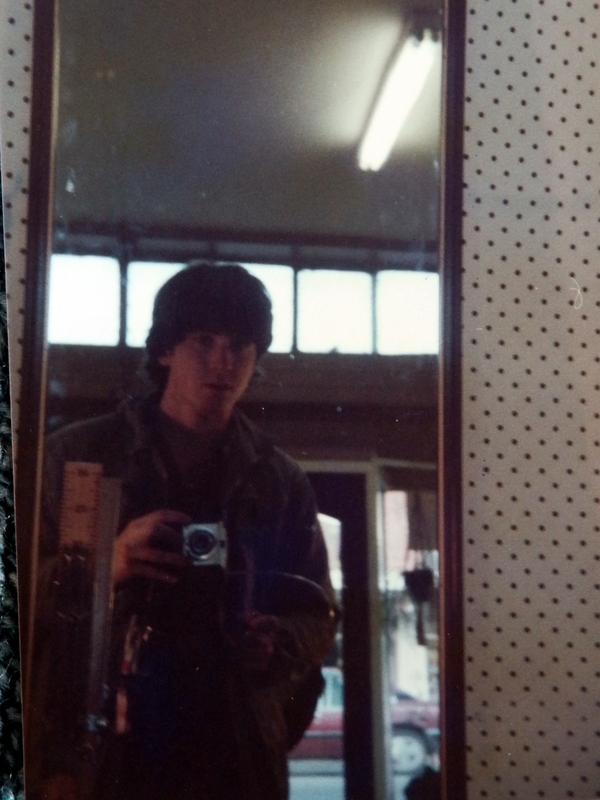 I was soon shooting a roll of 24 a month (kids take more selfies going to the dunny these days), and, unsatisfied with the patchy results, I soon made my first big-ticket non-musical instrument purchase buying a 2nd hand Nikon EM SLR from Fox Talbot under the Canterbury Centre for $499. So, what became of all that, the hopes and dreams of a 17 year old? On the 3rd Mr Fitzgerald gave me an application for Teachers’ College, but I never filled it in – I had had enough of school. But I hadn’t had enough of learning and on the 16th I went to an open day at the University of Canterbury and, liking what I saw, the following year I went to do Religious Studies, History and Classics (it’s all about story for me). Big surprise, I didn’t become a rock star, even though I tried (to a certain degree). That said, when my daughter said to me last year, ‘Dad, the best thing in the world to be is a rock star’ I replied, gilding the lily a tad, ‘Daddy used to be a rock star’. She was so impressed she told everyone at school (so her teacher said). I’m not sure squealing school girls chasing you for autographs in Chancery Lane on the Friday night after we played at Hillmorton High counts, although I think it’s enough for me. Back of my Applied Maths book. Clearly more interested in writing and drawing, I got 16% on the mock test. 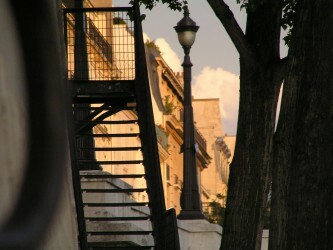 I continue to be an obsessive photographer…I have a collection of many cameras. It’s how I see the world, and the internet (and Facebook) have been wonderful for indulging that passion. However, I don’t draw anywhere near as much as I once did, which is a shame. I want to remedy that. I’m not entirely lost to music but my last ‘rock’ gig was in Auckland in the late ‘90s. Being in a band was like being married to several people at once and I just don’t have the oats for that any more. However, I have a guitar I occasionally play, knocking out satirical ditties to salve perceived wrongs in the world, and, best of all, I have joined a local singing group which I thoroughly enjoy. Amongst others, we’re learning Bill Wither’s Lovely Day and I am astounded to be only one who can hit and hold the 7-bar ‘Daaaaaaaay’ in the chorus…it feels as transcendent as flying without wings. But my main engagement with music is intellectual; I listen to it, think about it a lot and could write about it till a cow jumps over the moon. But hell, this was meant to be 700 words and here are 2,500…far more than a blog should be. My next will be shorter, and about music, I promise. I will finish on something mundane, yet important, I discovered reading my calendar. On the 29th I picked up sister Michelle from the bus station (where the Casino now is) from a holiday with whanau in Oamaru. She gave me a present of lollies and a diary. 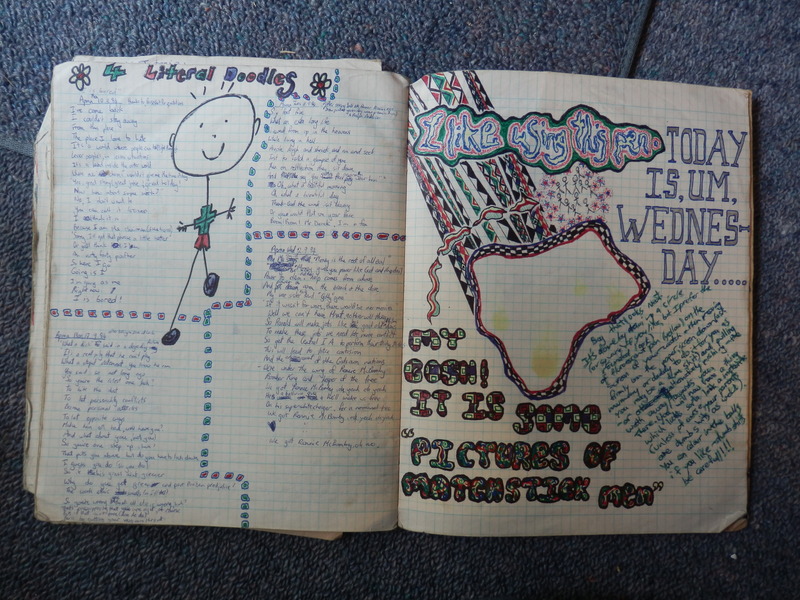 It was my first diary and my obsession with filling it with words grew ever bigger, as you can see. 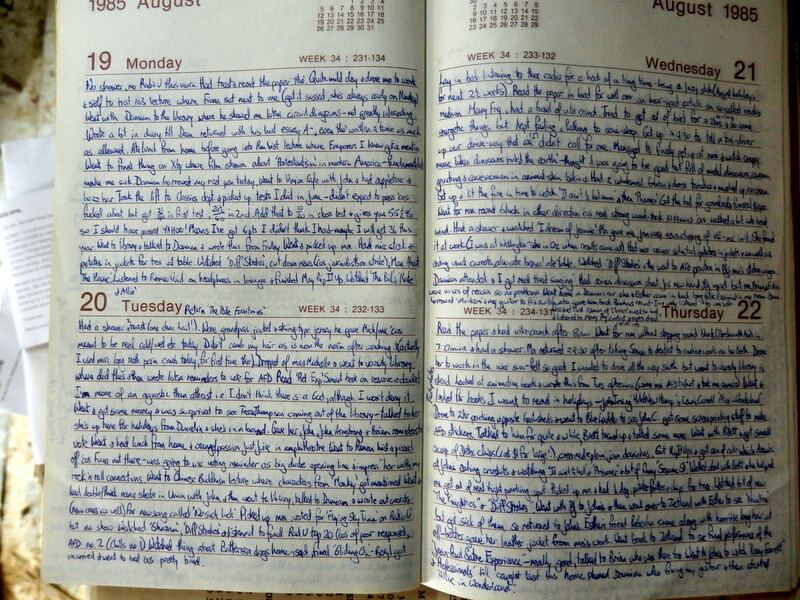 The following diaries would have a page for each day, with at least 1,000 words (at a guess). I’m a bit scared to look at them. Imagine what I could unpack from those mundane rambles? This entry was posted in Blogs, Family, Food, History, Memoir, Music, Whanau, Writing and tagged All Fall Down, Bill Direen, Blue Ladder, garage bands, Gladstone, Mt Cook, photography, Radio U, Radio With Pictures, Ready To Roll, The Great Unwashed, vogarts on August 23, 2014 by Kambl.